What do you get 2 year olds for their birthday or for Christmas? The good news is there are thousands of amazing toys that appeal to toddlers this age. 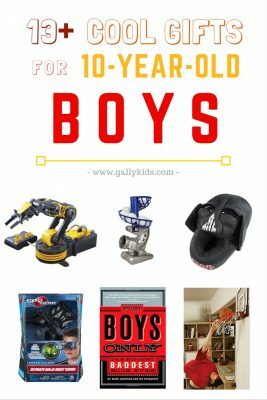 So to make it easier for you, I’ve picked out the top toys for 2 year old boys (and girls love these too!) so you don’t have to. When it comes to giving the best Christmas gifts for toddlers, you have to forget what is popular. Instead, think about what he/she is currently into at the moment. When my son was 2 years old, umbrellas fascinated him. I can’t remember why now. It must have been from a tv program or a book, but he was crazy about it. So when Santa came, he came with an umbrella. And believe you me, that umbrella was his favorite toy for a few good months. He even made sure it was right next to his bed at night. Yes, he was that into it.. 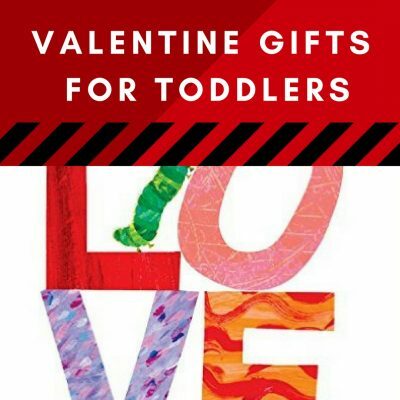 Anyway, if you’re looking for some tips to take you to the right direction, here are some great toddler gift ideas to choose from. Note: This post contains affiliate links. This means we get compensated when you click a link to one of our partner sites and make a qualifying purchase. There are a lot of different types of toys for kids. 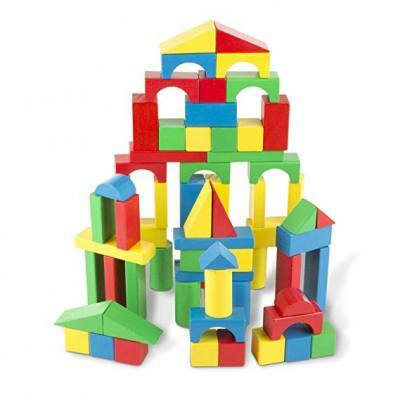 But one of the toys that has stood the test of time are wooden building blocks. And every 2 year old should have one. These Melissa and Doug wooden building blocks are great for developing their imagination and for learning some basic engineering concepts. This makes for a great open-ended toy. It doesn’t come with a set of instructions on what building to make. Instead, it’s a great toy for giving a child free-reign on what to do with the blocks. He can make a fine work of architecture with it, of course, but that doesn’t have to be the ultimate goal. It’s also a great toy for teaching Math concepts like shapes and sorting. 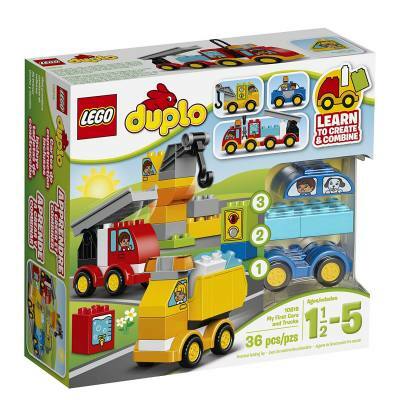 This set has 60 pieces and comes in a wooden box for easy storage. Ok, not a toy. 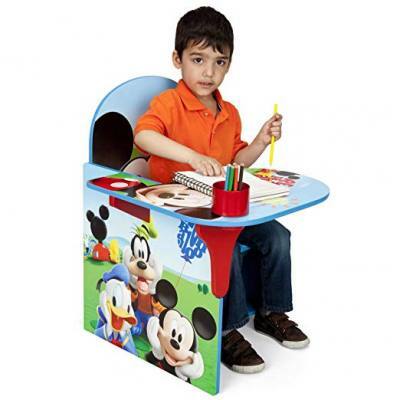 But if you gift this chair and desk to a 2 year old who loves Mickey Mouse, youĺl be his favorite person for a very long time. Besides, it’s a useful piece of furniture that will be in use for many years to come. Your child can use this for snack time or for doing his “work”. I love that it has both a cup holder and a storage area. This is low enough to the floor that a toddler can easily seat on and off it whenever he wants. Just the perfect size for little ones. Just how many years has Sesame Street been on tv? I remember it was already on when I was just a wee child :-). And now it’s the 21st century and it is still going as strong as ever. In fact, Elmo continues to be one of the well-loved characters by young kids. So why not get him this Gund Sesame Street? 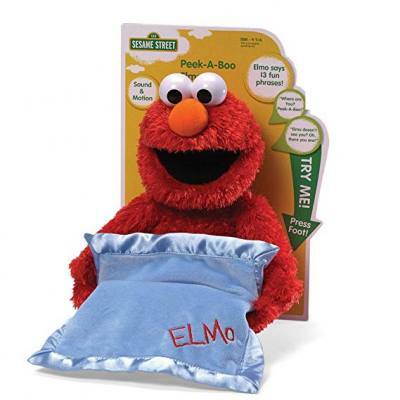 This is a huggable Elmo stuff toy that also makes a great play companion, too. It recites 13 phrases while hiding behind his blanket and then popping back out again with an accompanying giggle of course — just like the “real” Elmo. You can also get a Cowboy Elmo, a Baseball player Elmo or a Nursery Rhyme Elmo. Each one does different things. Check it out. Jigsaw puzzles are one of the most useful toys your child can have. It doesn’t only provide many hours of entertainment but it is also a great tool for developing cognitive motor skills. Many research studies have shown that puzzles help accelerate the development of fine motor skills, creativity, and spatial skills! Talk about hitting many birds with one stone! 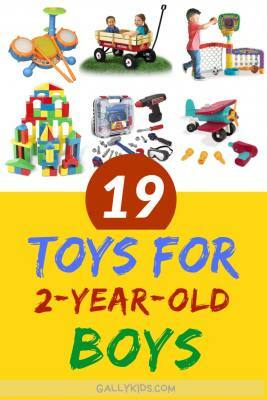 There are many different puzzles for toddlers that are perfect for 2 year old boys. If your son hasn’t shown any interest with puzzles yet, start with something simple like a wooden shape sorter. For more advanced puzzles, there are chunky 12-piece puzzles that are perfect for 2 year olds. Check out this page for our article on the best toddler puzzles. Interactive toys seems to be all the rage these days and the Doc Mcstuffins time your checkup doll meets just that requirement for all Doc Mcstuffins fans. 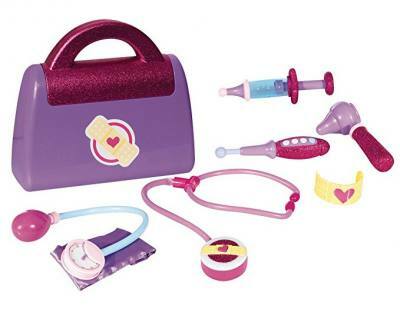 This Doc Mcstuffins doctor’s bag comes with Doc’s bag, play thermometer, syringe, blood pressure cuff, horoscope, bandage cuff, sticker sheet and Doc’s magical stethoscope. There are tablets that toddlers can use now but I recommend starting with something like the Leapfrog fridge phonics. Like all Leapfrog products, this Leapfro Fridge Phonics electronic toy that teaches kids some basic concepts. This particular one teaches them the alphabet. The main frame that attaches to the fridge is a bus so your child can pretend the letters are getting on it as he plays with it. The bus “says” the sound of the letter and sings a song as a letter is attached to it. Do you need something to entertain your child while you’re cooking and still have him nearby? This is the perfect toy for that. And he’s learning too! This is a fun toy for boys who like cars or love to copy a parent while driving. Or have you got a boy who just can’t get enough of honking your car or pretending he’s a driver? 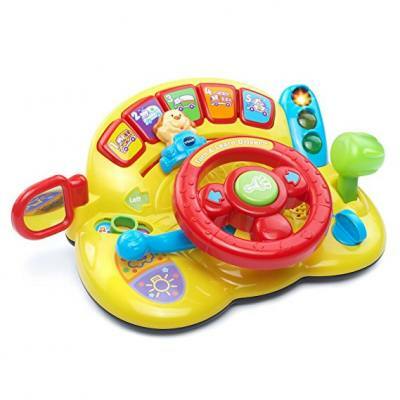 He’s going to love this Vtech Toys Turn and Learn driver. The wheels turn from left to right which makes it great for pretend play. Parents find this especially helpful during car journeys. It keeps them quiet, engaged and occupied as they pretend to drive their “car”. Apart from the wheel, there are also other buttons that makes a noise or lights up every time a toddler touches or presses it. Perfect gift for young toddlers. This is one toy that will grow with your child. It encourages creative and imaginative play and most children love spending hours playing at a water table. This is great for both indoor and outdoor play. Although if you do take it inside, just be prepared for a whole lot of mess — sand all over the play room is not a pretty sight. One thing I suggest is that instead of using sand, you can use beans, corn or rice. They won’t be useful for making sandcastles but they’re easier to clean and safer for the kids too. Building toys are always a popular gift. Kids usually love it and parents are more often than not happy that their child is learning while playing. You gotta get the little engineers trained at a young age, right? Anything construction related is always good for boys. Drill em, put them apart, put them together again. These gifts for toddlers are always a Christmas staple. I know the battery-operated drills look very cool but if you want your child to get screwing with their hands and get those fine-motor skill mastered, do away with it. 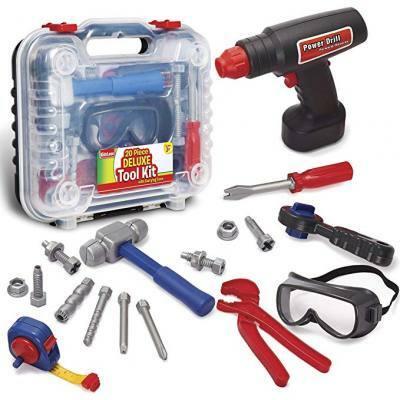 Here’s a nice set of construction tools with over 19 pieces and even an electronic cordless drill. I find that a lot of different musical toys make for a great toddler gift. 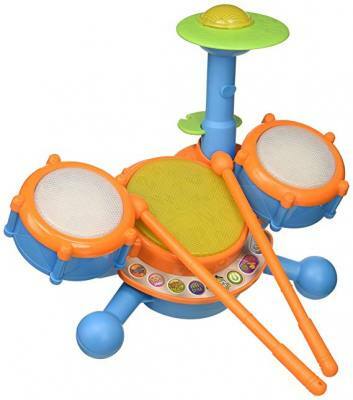 From drums, to xylophones to a hape rhythm set, these toys are almost always “music” to a 2 year old’s eyes. Just imagine all the opportunity for a lot of banging, blowing and strumming. Nothing could be more fun (and educational!). The whole sensory experience is always a treat for kids. Who knows you might even find out that your child is a musical genius. For musical minded kids, a drum set like this one by Vtech KidiBeats is the one to give. Get the parents ready for it as there’s bound to be lots of banging immediately after christmas. They might want to soundproof their child’s room 🙂 ! 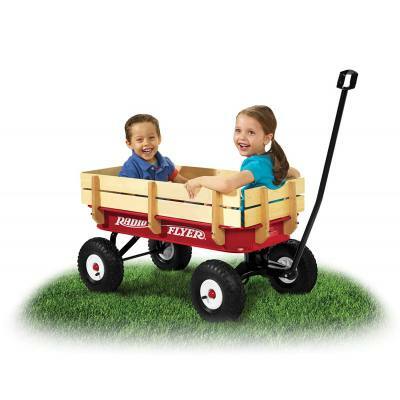 This Radio Flyer All Terrain Steel And Wood Wagon is a superbly rugged wagon that you can use virtually anywhere and for any number of tasks. It is as good at hauling your children as it is gardening equipment, BBQ stuff, beach gear or rubble. It is just the thing for making family trips away a lot less stressful and tiring. You can even use it for moving things around the house. This robust wagon does it all! It is an absolute god-send for family trips away when you need to move a two year old, camping gear and all the other assorted equipment that comes with a family trip away. Just load it up with stuff, strap the child in his seat, and you’re off! Smoothly and easily. It also gives the little one something to play in and occupy himself when you are getting things organized at the other end, not to mention how much better your back will feel! Frankly, I think my son could have done without one at a very young age. But it was one of those presents that he really wanted to have because all the neighborhood kids had it. And I tell you, the look on that little boy’s face when he opened his present was priceless and I’m sure a lot of other kids would like to get one too. 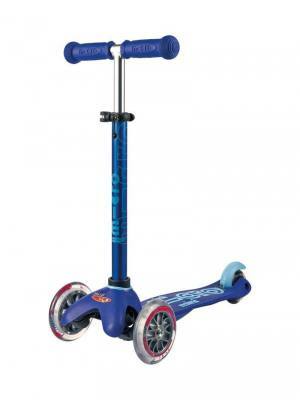 If you think your 2 year old boy would love to have a kick scooter, this is one of the most highly rated ones. 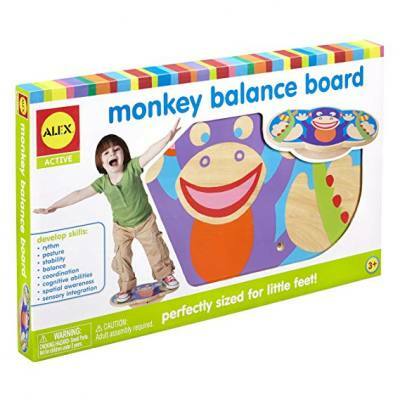 Oh what fun this Monkey balance board is. And if you have a 2 yr old boy who loves to move you’ll find that this balance board will keep him happy and occupied for a long time. And did you know that balancing is a very important developmental milestone? It helps with a child’s rhythm, coordination, spatial awareness and sensorimotor abilities. With a balance board, your child develops all these skills while having fun too. Now that’s just my kind of toy. The perfect to get that little toddler body moving and exercising. And if you can see that he already likes sports, so much the better. 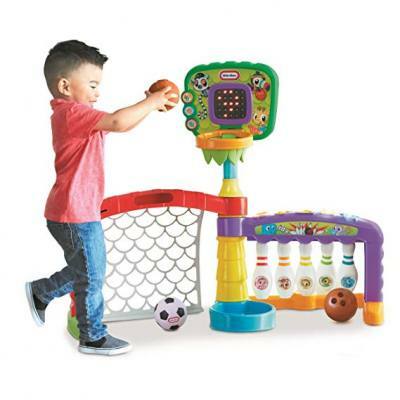 The Litte Tikes Sport Center has a basketball hoop, a soccer goal and bowling set. 3 different possiblities to entertain your child. 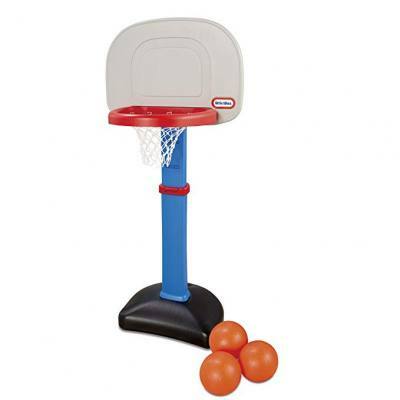 They’re great for developing gross motor skills, practicing hand-eye coordination and developing confidence. 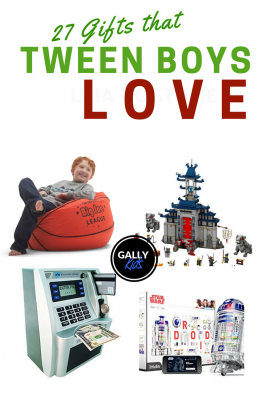 If you still can’t find the perfect gift for your 2 year old boy, narrow your search by thinking of themes. 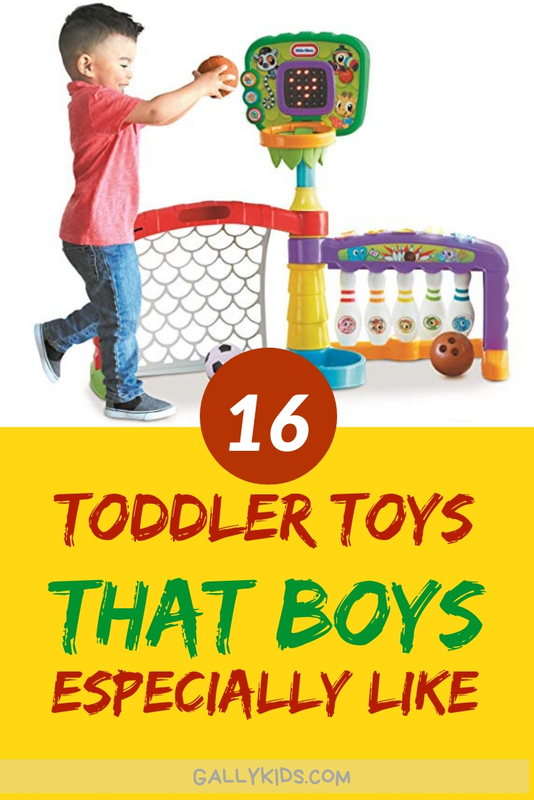 Most toddler boys will have a specific interest at this age. And anything related to that interest is almost always going to be a wanted item for birthdays or Christmas. Here are some “themes” to help you. The best pirate toys are here courtesy of Jake and the Neverland pirates gang. From the 7-piece figure playset to the bestselling ship, buy these Jake Neverland Pirates toys which are sure going to make your little one’s day. Fisher-Price’s Jake’s Musical pirate ship Bucky is currently one of the top-rated toys on Amazon. The reviews are in and many parents are quite happy to have Bucky in their homes :-).. For a fan of the show, these Jake Neverland Pirate toys are going to be very well-received indeed. But the musical ship is not the only one available. There are a whole set of toys that can fully recreate Jake and his friends magical land. This includes action figures, bath toys, talking spyglass, telescopes, a playhut, Captain Hook’s battle boat and so much more! So what are you waiting for? Check out all these cool Pirate toys and let the fun begin. Dinosaurs, many little boys are fascinated by it. 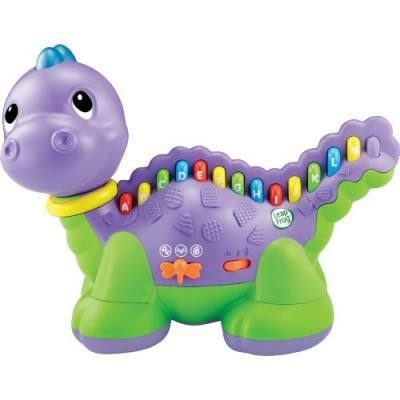 The leapfrog lettersaurus will get them to know their letters or to encourage creative play, you can buy them some dinosaur figures or stuff toys. For many boys, the word car is often one of the first words they say. And this fascination with anything that moves or has an engine goes on for a very long time (well, the men in our lives are still into it, aren’t they?). 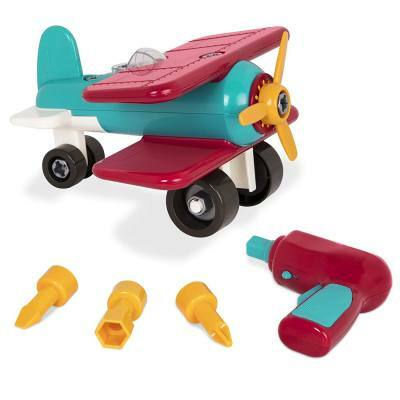 I love the Battat take-apart airplane— they get to play imaginatively with it plus they practice those little hands too. Books are always good presents. Always. I have to warn you though that when you give a book during Christmas, it may be overwhelmed by all the toys and it will probably not get as much excitement as toys themselves. BUT and this is a big but, it’s one of those gifts for toddlers that will be used long after all the other toys are gone. It isn’t Christmas when the children are not dressed into little Fairies, Spiderman or Santa. Find out what imaginary character the child likes right now and find a corresponding costume. No matter how popular and in demand toys are in many children’s Santa list, clothes are still one of the more practical presents you can give to a child. Funny shirts are always good as are clothes with characters that the toddler is currently interested in like Dora, the Octonauts, Mickey Mouse or Elmo. 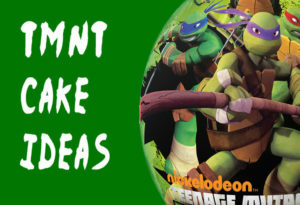 Have you found any good ideas on this page? Do you now know which type of toy to buy? 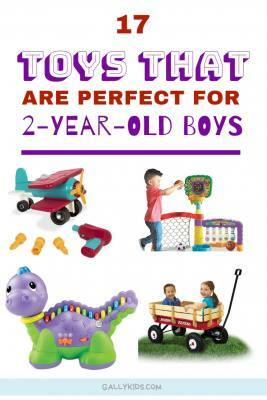 Do you have any other ideas for age-appropriate gifts and toys for 2 year old boys? I would love to hear about them. Please write in the comment section below for any ideas you have that is not listed here.